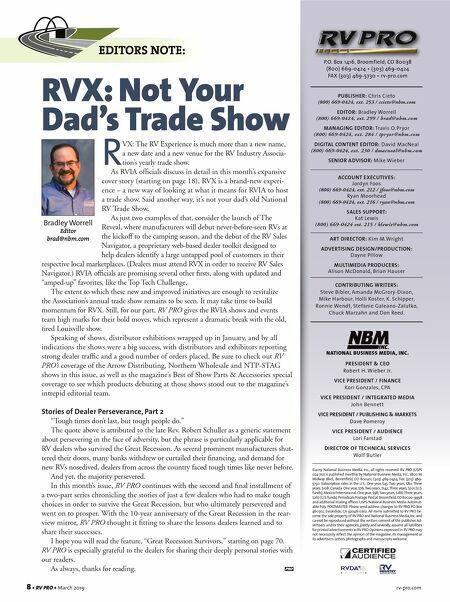 RVX: Not Your Dad's Trade Show EDITORS NOTE: 8 • RV PRO • March 2019 rv-pro.com R VX: The RV Experience is much more than a new name, a new date and a new venue for the RV Industry Associa- tion's yearly trade show. As RVIA officials discuss in detail in this month's expansive cover story (starting on page 18), RVX is a brand-new experi- ence – a new way of looking at what it means for RVIA to host a trade show. Said another way, it's not your dad's old National RV Trade Show. 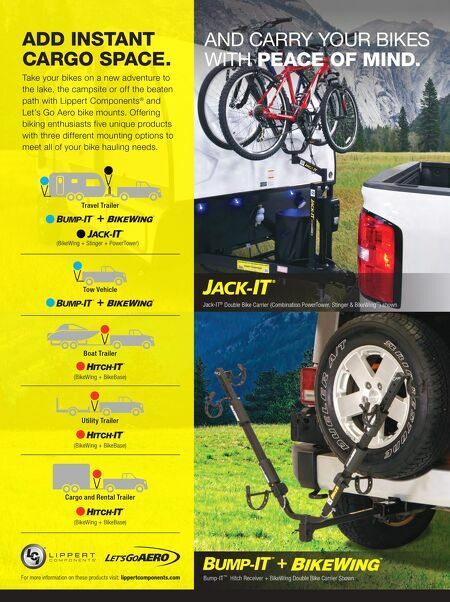 As just two examples of that, consider the launch of The Reveal, where manufacturers will debut never-before-seen RVs at the kickoff to the camping season, and the debut of the RV Sales Navigator, a proprietary web-based dealer toolkit designed to help dealers identify a large untapped pool of customers in their respective local marketplaces. (Dealers must attend RVX in order to receive RV Sales Navigator.) RVIA officials are promising several other firsts, along with updated and "amped-up" favorites, like the Top Tech Challenge. The extent to which these new and improved initiatives are enough to revitalize the Association's annual trade show remains to be seen. It may take time to build momentum for RVX. Still, for our part, RV PRO gives the RVIA shows and events team high marks for their bold moves, which represent a dramatic break with the old, tired Louisville show. Speaking of shows, distributor exhibitions wrapped up in January, and by all indications the shows were a big success, with distributors and exhibitors reporting strong dealer traffic and a good number of orders placed. Be sure to check out RV PRO's coverage of the Arrow Distributing, Northern Wholesale and NTP-STAG shows in this issue, as well as the magazine's Best of Show Parts & Accessories special coverage to see which products debuting at those shows stood out to the magazine's intrepid editorial team. Stories of Dealer Perseverance, Part 2 "Tough times don't last, but tough people do." The quote above is attributed to the late Rev. Robert Schuller as a generic statement about persevering in the face of adversity, but the phrase is particularly applicable for RV dealers who survived the Great Recession. As several prominent manufacturers shut- tered their doors, many banks withdrew or curtailed their financing, and demand for new RVs nosedived, dealers from across the country faced tough times like never before. And yet, the majority persevered. In this month's issue, RV PRO continues with the second and final installment of a two-part series chronicling the stories of just a few dealers who had to make tough choices in order to survive the Great Recession, but who ultimately persevered and went on to prosper. With the 10-year anniversary of the Great Recession in the rear- view mirror, RV PRO thought it fitting to share the lessons dealers learned and to share their successes. I hope you will read the feature, "Great Recession Survivors," starting on page 70. RV PRO is especially grateful to the dealers for sharing their deeply personal stories with our readers. As always, thanks for reading. Bradley Worrell Editor brad@nbm.com P.O. Box 1416, Broomfield, CO 80038 (800) 669-0424 • (303) 469-0424 FAX (303) 469-5730 • rv-pro.com ©2019 National Business Media, Inc., all rights reserved. RV PRO (USPS 024-712) is published monthly by National Business Media, Inc., 2800 W. Midway Blvd., Broomfield, CO 80020.; (303) 469-0424; Fax (303) 469- 5730. Subscription rates in the U.S.: One year, $45; Two years, $80; Three years, $108; Canada: One year, $76; Two years, $142; Three years, $201 (U.S. funds); Mexico/International: One year, $98; Two years, $186; Three years, $267 (U.S. funds). Periodicals Postage Paid at Broomfield, CO 80020-9998 and additional mailing offices. USPS/National Business Media Automat- able Poly. POSTMASTER: Please send address changes to RV PRO, PO Box 460702, Escondido, CA 92046-0702. All items submitted to RV PRO be- come the sole property of RV PRO and National Business Media, Inc. and cannot be reproduced without the written consent of the publisher. Ad- vertisers and/or their agencies, jointly and severally, assume all liabilities for printed advertisements in RV PRO. Opinions expressed in RV PRO may not necessarily reflect the opinion of the magazine, its management or its advertisers. Letters, photographs and manuscripts welcome. NATIONAL BUSINESS MEDIA, INC. PRESIDENT & CEO Robert H. Wieber Jr. VICE PRESIDENT / FINANCE Kori Gonzales, CPA VICE PRESIDENT / INTEGRATED MEDIA John Bennett VICE PRESIDENT / PUBLISHING & MARKETS Dave Pomeroy VICE PRESIDENT / AUDIENCE Lori Farstad DIRECTOR OF TECHNICAL SERVICES Wolf Butler PUBLISHER: Chris Cieto (800) 669-0424, ext. 253 / ccieto@nbm.com EDITOR: Bradley Worrell (800) 669-0424, ext. 299 / brad@nbm.com MANAGING EDITOR: Travis O. Pryor (800) 669-0424, ext. 284 / tpryor@nbm.com DIGITAL CONTENT EDITOR: David MacNeal (800) 669-0424, ext. 230 / dmacneal@nbm.com SENIOR ADVISOR: Mike Wieber ACCOUNT EXECUTIVES: Jordyn Foos (800) 669-0424, ext. 212 / jfoos@nbm.com Ryan Moorhead (800) 669-0424, ext. 216 / ryan@nbm.com SALES SUPPORT: Kat Lewis (800) 669-0424 ext. 215 / klewis@nbm.com ART DIRECTOR: Kim M. Wright ADVERTISING DESIGN/PRODUCTION: Dayne Pillow MULTIMEDIA PRODUCERS: Alison McDonald, Brian Hauser CONTRIBUTING WRITERS: Steve Bibler, Amanda McGrory-Dixon, Mike Harbour, Holli Koster, K. Schipper, Ronnie Wendt, Stefanie Galeano-Zalutko, Chuck Marzahn and Don Reed.